Join the Defective by Design (DbD) crew and celebrate International Day Against DRM (IDAD) this September 18th! For 12 years, we've celebrated IDAD -- making, organizing, protesting, and taking action to support the demolition of Digital Restrictions Management (DRM) -- and 2018 is no different! This year we will continue the fight against DRM and celebrate the work of activists, artists, and technologists who create DRM-free media and technology. You can read more about past IDADs online. We know that as members of the DRM Elimination Crew, you already use less DRM than anyone else, and many of you none at all. Take this day as an opportunity to tell everyone else what they should be avoiding and to share your experiences. 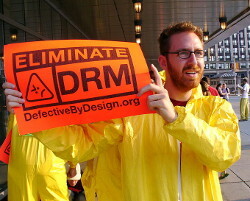 Together, we can send a powerful message: DRM's days are numbered. Want to help others keep up-to-date with IDAD news? You can share the mailing list with them at DefectiveByDesign.org.